Players taking my golf lessons often have problems getting the ball airborne. Reason: They either try to scoop the ball in the air or they have a swing fault correctable only through focused golf instruction sessions. Whatever the case, they have a hard time getting the ball in the air. This inability has a huge impact on your golf game and your golf handicap. To improve both you need to overcome this problem. Clubs with offset design can help. They offer benefits “both performance and visual” that not only help launch the ball quicker and easier, but also help you shoot lower scores and reduce your golf handicap. Offset isn’t just for visual effect. It offers real benefits that help a golfer make better shots. But explanations of those performance benefits are often unclear or not detailed enough to explain why to the average recreational golfer. There are two schools of thought on the benefits of offset design. One school attributes offset’s edge to the position of the player’s hands at impact. This school holds that with the clubhead’s leading edge behind the forward-most portion of the shaft, the golfer’s hands will be farther ahead at impact. This effectively delofts the club at the moment of impact, resulting in lower shot trajectories. So while you get the ball in the air quickly, it flies at a lower loft. The second school of thought is diametrically opposed to this theory. It contends that with the leading edge behind the forward-most position of the shaft, the clubs center of mass is moved back, causing a bowing forward of the shaft. This bowing effect increases the clubs loft, driving the ball airborne faster. Both schools would seen to have some merit to their arguments. But club manufacturers have conducted tests on offset design. These tests tend to confirm the second school of thought. They also confirm that offset is a vital design element in game-improvement clubs. Clubs with offset design tend to launch the ball higher regardless of the player’s swing speed or the ball’s construction – two key factors. Why? The clubhead lags behind the shaft slightly whether a person with a low golf handicap or a high golf handicap is swinging it. In both cases, the centrifugal force created through the swing bends the club downward and forward as the center of mass attempts to catch up with your hands. The farther back the center of mass and the more offset the club, the more pronounced the bend of the shaft. As a result, shots hit at a variety of swing speeds, including those associated with recreational golfers, tend to launch the ball faster than those hit with clubs lacking offset, although they also tend to achieve a slightly lower apex. They also carried almost 20 yards less than those hit at a pro’s swing speed. Keep in mind that in addition to swing speed, the degree of launch is also affected by the type of ball hit. Besides better launch angle and overall shot trajectory, clubs with offset design offer visual benefits as well. For example, you often hear players talk about the “look” of a club. They’re referring to how the club looks at address, when you’re staring down the shaft at the blade. One element contributing to this “look” is “topline thickness” how the top of the clubs blade looks at address. Certain players like a thin looking topline while others like a thicker looking topline. Recreational golfers tend to like a thicker topline. They feel more confident playing with a club with a slightly thicker looking topline than a thinner one. If you’re a golfer with a high golf handicap, odds are a smaller thinner clubhead would a bit more intimidating than a thicker topline. 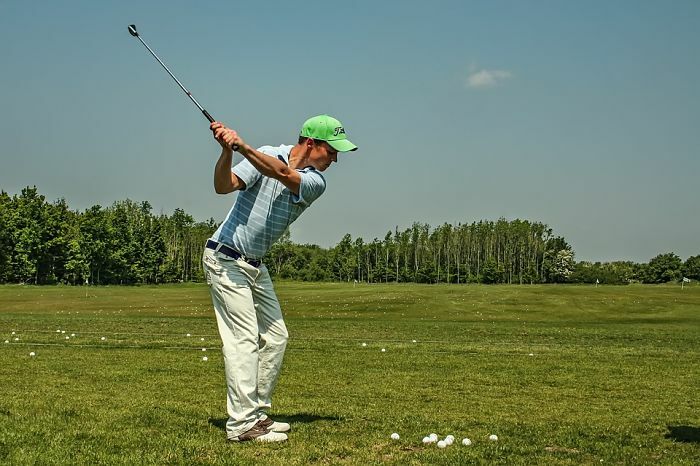 Applying this information to your game can help improve your scores and your golf handicap. As a player you want to play the most forgiving clubs possible, regardless of design. If you’re having problems getting the ball airborne, you’ll want clubs that helps you get the ball in the air. If that’s the case, you might benefit from trying irons with varying degrees of offset. They can help you get the ball in the air faster and with less effort. In addition, consider offset for your woods as well. Metal woods also offer the benefit of offset. For some golfers looking to lower their golf handicaps, they may be extremely playable. Consider this are well.